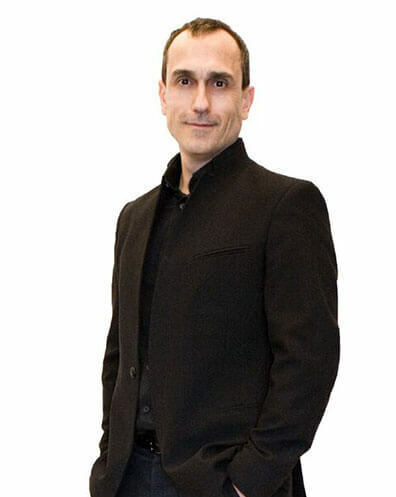 This master hairdresser might be garnering press for his stunning work and flourishing career at Headlines Salon & Spa near Toronto, Canada, but it’s his easygoing philosophy and raise-the-bar attitude that keeps Marc Galati ahead of the pack. “Things happen. You just have to shrug them off, keep going, and remember what’s important at the end of the day,” he explains. Despite that laid-back vibe, Galati is anything but chill about his craft. “Everyone expects a good haircut. But you have to make it better by making sure the great work is there, the customers are taken care of, they feel comfortable, and they can’t wait until their next visit. That’s the ultimate goal.” As far as we can tell, this “headliner” is achieving it–big-time. Bragging rights: Winner of the Makeover Competition on CityLine, Canada’s longest-running lifestyle show. On my nightstand: My phone. I’ll cry if I’m out of: Hair Shake. What I’m eating when no one’s looking: Potato chips. If anyone could dress me: John Varvatos. What’s on my feet: Anything by Bunker. Can’t live without: Hair Shake! Guiltiest pleasure: Musical theater, and enjoying dinner out with my wife. Biggest misconception about hairdressers: That this is a hobby. It’s actually our profession and our passion. Why hair? : Why not? I love making people feel good about themselves. What I’m known best for: A sense of humor. Oh yeah…and short haircuts! The look I never want to see again: The 1990’s “Rachel” cut. This hairstyle/color will never bore me: Graduated bobs and anything red. Best advice ever: Know what one-inch looks like! “I’ve made it” moment: Being on stage with Sue Pemberton. What’s playing in my salon: Classic rock. Tool/product I’m always reaching for: Scissors, comb…and Hair Shake! Can you tell I love the stuff?